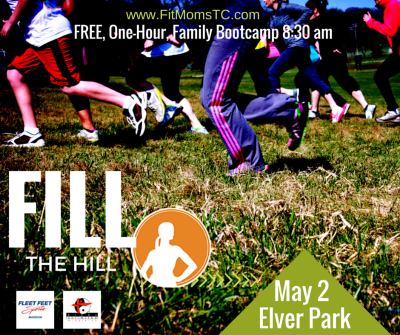 "Fill the Hill" is a free family outdoor workout event designed to get families outside, exercising and having fun together. It is the kickoff event for spring and summer outdoor sessions of Fit Fun Boot Camps by Fit Moms Transformation Center of Madison. Our mission is to beat our record and have more than 200 people working out and having fun. This year we have a Running Expert from Fleet Feet Sports Madison to teach us how to climb that hill and an Expert Martial Arts Trainer from Kicks Unlimited Middleton to work/play with kids ages 4 - 9 in the tennis court area. each person and also bring your favorite healthy snack for your family and to share with other families. At Fit Moms Transformation Center, we call that a "snack-luck". Fill the Hill is a time-honored Fit Fun Boot Camp tradition to introduce or re-introduce families in Dane County to our outdoor programs that start in May. There are three convenient outdoor locations, exclusive to Fit Moms Transformation Center. Madison West, McFarland and Oregon.